Laugh it up, Gotham-ites. After this week's episode, the only one even remotely smiling is gonna be baddie Jerome Valeska (Cameron Monaghan). Last seen surprising new Arkham resident Penguin (Robin Lord Taylor) in the midseason finale, we're finally about to see what the clown prince of crazy has in mind for not just the asylum's inmates, but also for the outside world. 'Gotham' Season 4 Returns: Check out Gordon's Secret 'Stache! All it takes is a toxic case of Poison Ivy and suddenly, everything seems fuzzy. 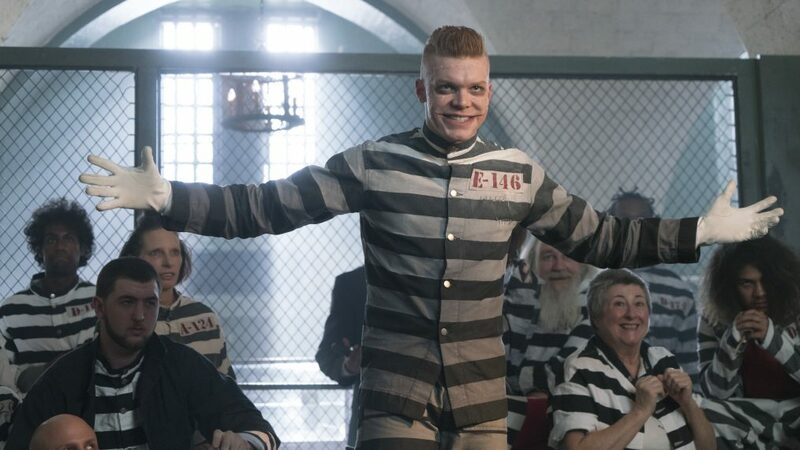 "Arkham is just the very first step in a multi-faceted plan to take down his enemies and Gotham at large," explains Monaghan (Shameless), who is returning as the proto-Joker for a bunch of episodes leading up to the Season 4 finale. In Thursday's episode, "A Dark Knight: A Beautiful Darkness," we see that Jerome has the king of Gotham's favorite lock-up—which is hell for poor Penguin—and it won't be long before he's running the streets, too. That means trouble for past foes Jim Gordon (Ben McKenzie) and Bruce Wayne (David Mazouz), as well as a player to be named later. "He also has a new target," confirms Monaghan. "There is someone else that he wants to hunt down and take a certain revenge on." So why try to take over a city he's already failed at conquering? The scene-stealer confesses that his stitched-faced villain's latest plan is bigger and bolder. "[Jerome] wants a greater sense of destruction, a greater sense of chaos," Monaghan reveals. "He wants to bring all of that to a grander scale. He is all about expansion, so he wants to maximize the amount of suffering that he causes." The endgame: To turn the city into a literal madhouse. "And Jerome has a way to fully accomplish that. We'll see him developing new techniques," some of which Monaghan says "will be very familiar to fans of the comics." Superman's favorite city is getting the prequel treatment for DC's digital platform. And speaking of cribbing from Gotham's DC Universe source material, Monaghan is excited to announce that Jerome will be building what he refers to as "our Legion of Horribles," which is sure to to leave fans shook. "He's teaming up with people that we've never seen him with before, so it's cool to see these iconic characters gathered together. It reminds me of [Batman's 1996-97 storyline] The Long Halloween...it looks like something straight off the comic-book panels." Among the squad of "Horribles" will be Penguin, the Mad Hatter (Benedict Samuel), Scarecrow (Charlie Tahan), Solomon Grundy (Drew Powell), Firefly (Camila Perez) and Mr. Freeze (Nathan Darrow). "It's a whole rogue's gallery that will be working together to [terrorize] Gotham in a way we've never seen before," Monaghan says. It's a good thing Bruce is getting closer to his caped-crusader destiny (especially after tonight's fateful alley interaction with [spoiler]), because Gordon is gonna need as much backup as he can collect this time.